Boko Haram came to 25-year-old Fanna Liman Mustafa’s home in Baga in northeastern Nigeria in November and burnt it to the ground. She took her four children and fled across the border into Niger. As fate has it, she is one of the lucky ones. The Islamist militants returned in January and massacred hundreds if not thousands of civilians. “We lost everything in the fire caused by the attacks,” 25-year-old Mustafa told IRIN, explaining how they’d arrived in Niger’s southeastern Diffa region with the clothes they were wearing and little else. Nigerian families first began seeking refuge in Niger in 2013, but Boko Haram-related violence in the region has spiked in recent months, causing the number of refugees to balloon and leading to a fast-growing humanitarian crisis that garners little international media attention. An estimated 150,000 displaced people in Diffa are in urgent need of greater humanitarian assistance, including food, aid agencies say. Boko Haram attacks have now reached Diffa town itself, meaning those who had been hosting refugees are now becoming displaced themselves. Most refugees have little to no access to health care or education and are still short of basic necessities, including water and shelter. Food security assessments are still being completed, but at least 65 percent of the displaced people, including refugees, returnees and internally displaced people (IDPs), say they don’t have adequate access to food, according to Save the Children. Like Mustafa, the majority of Nigerian refugees settled within host communities as there were no official camps until the first opened on 30 December. The UN’s refugee agency, UNHCR, has helped to relocate a few hundred people to the camps, but an estimated 60 percent of the displaced remain “homeless,” living in makeshift shelters built around trees, according to the latest assessment by the International Red Cross. People in Diffa, where nearly half the population live on less than $1.25 a day and malnutrition rates are among the highest in Africa, were already struggling to survive. Now, local families are sharing their limited food stocks with the refugees. The UN humanitarian coordination agency, OCHA, has reported that each local family is hosting an average of 17 people. Adding to that burden, many households were unable to go to their fields to plant last year because of the security situation. This means that the Diffa region produced just 55 percent of the cereal crops needed to meet its annual food needs and now faces a cereal deficit of more than 80,000 tons, according to OCHA. “In Diffa, the harvest was not very good and the combination of insecurity and bad harvest make it difficult for people to sustain their families,” said Niger country director for the World Food Programme (WFP) Benoit Thiry. Consequently, this year’s lean season, which is already under way, will be even harder than usual. Thiry said WFP was particularly concerned about the dire nutritional situation facing the region’s children. The global acute malnutrition rate of children under five in the Diffa region last year was 13.8 percent, already more than double that of Cameroon and Guinea-Bissau, for example. The number of similar-aged children admitted to nutrition centres has doubled and, in some communities, even tripled since then, largely due to the refugee crisis. Between 1 January and 26 April, there were 8,407 cases of severe acute malnutrition registered in the region among under 5s, according to the latest UN survey data. This compares to 3,168 cases registered during the same period in 2014. The Save the Children country director said donors couldn’t support the food needs of all the households in Diffa because there wasn’t enough funding. The UN’s $31.2 million Strategic Response Plan appeal for Diffa has been 55 percent funded, according to OCHA’s Financial Tracking Service. Nearly $14 million is still needed to continue operations until the end of the year. In order to attain legal status as a refugee and receive the full benefits in Niger, such as food aid and access to the camps, Nigerians are supposed to have the correct documentation. “Today, I have difficulty accessing basic services,” 36-year-old Binta Ali told IRIN, explaining that her family’s birth certificates and other papers were destroyed during Boko Haram attacks on their village in Nigeria, leaving them without any proof of identity. Each time I want to access services for refugees I must explain myself multiple times, in order to get benefits. 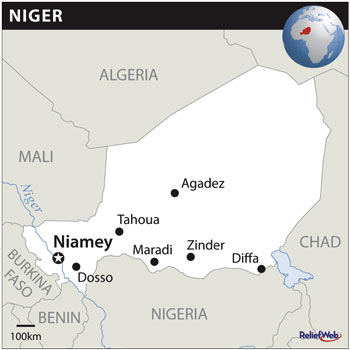 According to Niger’s interior ministry, more than 60 percent of displaced people no longer have identification documents to prove their nationality. "No birth certificate or no identity document means the basic rights of the target population will be violated and they cannot fully enjoy their rights [as refugees], and also risk becoming stateless," Alassane Seyboune, secretary general at the interior ministry, told IRIN. Niger’s national refugee commission, with support from UNHCR, says it has registered more than 10,000 refugees since mid-March and aims to reach 200,000 by the end of the year. This is an ambitious goal as it is difficult to access certain communities in the Diffa region due to the ongoing Boko Haram threat.